Highlands Cottage01600 860737work Self-cateringFour star converted stone stable in a peaceful setting in centre of Area of Outstanding Natural Beauty. 5 miles South of Monmouth. Disabled access. Wet room. Large sunny patio. Central heating. One bedroom (sleeps 4 in double bed and bunk beds). Walks, River Wye and golf nearby. Campsite also available. 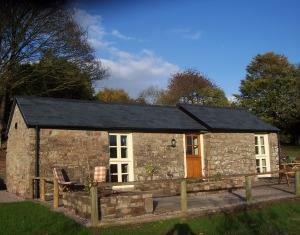 Four star converted stone stable in a peaceful setting in centre of Area of Outstanding Natural Beauty. 5 miles South of Monmouth. Disabled access. Please put NP25 4TY into Google Maps to find directions.